Step 1: Mouse over Tools, and click My Imports. Step 2: Find the import that you did. Remember, when you import a file, you can actually name the import. Otherwise, the default name will be a bunch of numbers… look closely and you’ll see that the numbers are the date you did the import. Just click the delete icon to the right of that file to delete all of those imported records. 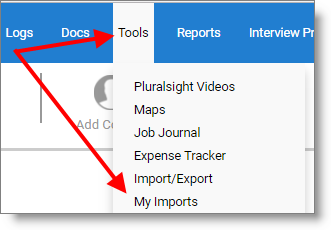 You can also click multiple checkboxes on the left, and delete multiple imports at the same time. NOTE: if you delete your import, we cannot roll this back. Once you delete them, they are gone… so make sure you really want to delete before you finalize the deletion!